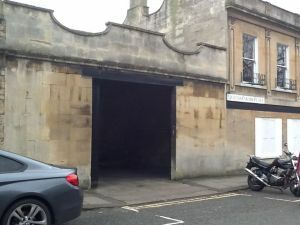 When our Sales Director, Nigel Hodges was called to a garage on Queens Parade Place, Bath it was with some trepidation, Nigel arrived early and with the old doors being open was able to inspect the property before the client arrived. A tramp had clearly only recently vacated and the building had become a non-Council endorsed local toilet amenity judging by the all powering odour! The building itself was in a very poor state of repair, with the steels blown out, dislodging the stonework and the existing large garage doors were rotten, needing brute force to close them. It wasn’t until Nigel met the client that he became inspired to know that this was going to be another transformational Hawkers project to be proud of. The client’s mandate was that he wanted a “Rolls Royce Job” having recently acquired the 100-year-old building. Working with Ryan Jordan of Bath Construction who over saw the stone work repairs and sourcing products from Coastal Group (steel runners), TBKS (jib door fittings) and Chew Valley Gates (electric remote closing mechanisms) our Production Director David Newman set to work on procuring some high quality French Oak and creating a design that would complement the Conservation Area setting by being a thing of beauty. 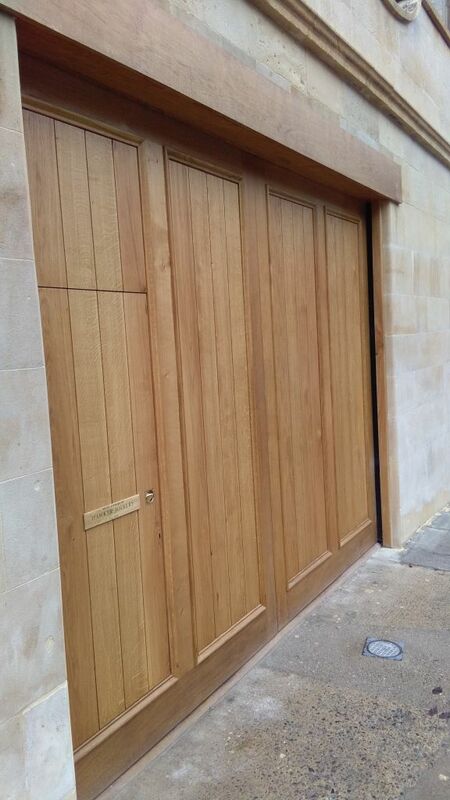 The doors were constructed in our workshop and given their size needed four men to fit on site, making the necessary adjustments for them to open and close seamlessly. Given the potential for UV rays and rain water they would be subjected to the oak received several coats of Osmo oil to ensure that they would be protected and maintain their lustre. Since installation we have been delighted to observe that they have become as much a tourist attraction as the surrounding Georgian architecture so much so that the Bath tour guides now stop adjacent to them every day.